Why do we call it the 1803 House? Who built it and why is it important? 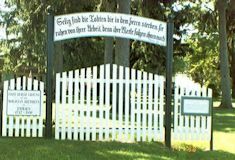 Jacob, Jr. was the son of Jacob Ehrenhardt who along with Sebastian Knauss donated the 100 or so acres to the Bethlehem Moravian church to establish a settlement in Emmaus. On land originally granted to William Penn and his father by King Charles II of England, German settlers began to settle into this area (known by the Lenni Lenape as “maguntsche”, or feeding place of the bears) in the early 1700’s. Moravians had established the industrial settlement of Bethlehem in 1741, and local settlers Jacob Ehrenhardt and Sebastian Knauss found themselves drawn to the church. So much was their desire to have the Moravian church establish a congregation in this area, that they donated a large portion of their land warrants for the creation of a “gemein-ort”; this was a closed congregational village in which people of similar spiritual needs could live and work together in harmony. They also built a small log church in 1742 on what would become the settlement’s cemetery – God’s Acre. In 1746 a schoolhouse was built, and in 1747 the local Moravian congregation was founded. Eleven years later the village was surveyed and a map drawn up [right...as displayed in the hall]. 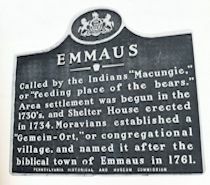 And in April of 1761 the name Emmaus was given to the settlement by Bishop Spangenberg, in a hymn he’d written recalling Christ’s appearance to two of his disciples on the road to Emmaus. The Moravian faith in which Jacob, Jr. was raised was one of strict adherence to the rules of the church. One couldn’t travel without permission of the “Warden”; no meetings could be held in the dark; marriages had to be approved by the church elders; and restrictions against noise and youthful playing were strictly enforced. Like the Quakers, the Moravians refused to bear arms, swear oaths, or to take part in political discussions. So, when troubles arose between the English king and the colonies, young Jacob and his community were faced with a series of events, which sorely tried their faith. They were asked to swear an oath, which would break their allegiance to King George III; and they were required by the Continental Congress to join the Pennsylvania Militia. It was a difficult time. Fines, imprisonment and confiscation of property faced those who refused to participate. The church diaries, kept by the Moravian ministers, make no mention of who was imprisoned for his faith, or who broke with his faith and joined the militia. No mention was made of the fact that twelve men from Emmaus did enlist in the Continental Army; or that in 1782; 22 year-old Jacob Ehrenhardt, Jr. joined the Northampton County Militia. 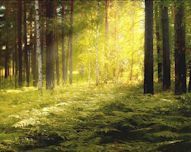 Jacob and the eleven other men would return from the war to live out their natural lives, and each would find his last resting place in God’s Acre [left]. In addition to a modest gravestone in the church cemetery, Jacob leaves behind his handsome Federal-style home. In the mid 1960's Rodale Press had purchased this property in the mid-1960’s for expansion of their business. Robert Rodale worried about tearing down the old house [right] on the property without first doing some research. He and Mayor Pierce Randall agreed that Rodale would donate the house to the borough, along with $10,000 in “seed money”, if a committee could be established to research the history of the house, and raise an additional $10,000 from the community if restoration was decided upon. Robert and Ardath Rodale then donated the house and property to the borough in 1974. Restoration began after the 1976 Bicentennial celebration, with that committee comprising the majority of the new "Friends of the 1803 House” committee.Today the Ehrenhardt house is administered by the Friends of the 1803 House, Inc. It has been listed on the National Register of Historic Places, and serves as a living classroom for the community at large. Through scheduled tours and various special events throughout the year, children and adults can obtain a glimpse into the lifestyle of the inhabitants of colonial Emmaus – into the lives of Jacob and Susanna Ehrenhardt and their four daughters. In 2003, The Friends of the 1803 House celebrated the passing of 200 years since Jacob Ehrenhardt, Jr. built this stone, Federal-style home for his wife Susanna and their four daughters. He located it just south of the Moravian Church, on a plot of land owned by his father; outside of the confines of the “congregational village” of Emmaus, but close to the heart of the settlement – the church. When standing at the 1803 House, what would you have seen looking around in the early 1800's? And to the South you would have seen a the "Gemeinhaus" [a building for worship] and God's Acre Cemetery. When Jacob Ehrenhardt, Jr. was born in the 1760’s, the village of Emmaus didn’t even have a name. The land on which Emmaus grew was donated by Jacob’s father and Sebastian Knauss in 1747 but wasn't named Emmaus until April, 1761. Emmaus was at that time a close religious community. Strict rules governed Jacob’s family and all inhabitants. One couldn’t travel without consulting the Warden. No meeting could be held in the dark. Marriages had to be approved by the Elders. And restrictions against noise and youthful play were strictly enforced. The Moravian and other religious groups that settled in the area also refused to bear arms, to swear oaths or to take part in political discussions. It was not in their interest, they said, to make or unmake governments but rather to use the privileges and opportunities which a government afforded. So, when troubles arose between the English King and the colonists, young Jacob and his community were faced with a series of events which sorely tired their faith. 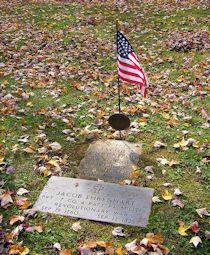 Jacob Jr. was the youngest of 10 children of Jacob and Barbara Ehrenhardt. In 1760 his father’s house was built (a stucco house across Keystone Avenue across from the Moravian church), also the year his father died. Their neighbor was Andreas Giering, a shoemaker...Jacob, Jr. became a shoemaker, which was probably not a coincidence. In 1782, when he was 22, he enlisted in the Northampton county Militia (now Lehigh County) with 11 other men to fight in the Revolution, and was promptly removed from the Emmaus congregation which he had formally joined only about a month before. The war lasted only one more year (1775-1783, ending with the Treaty of Paris), so Jacob and the other 11 enlistees returned home safely; all were eventually accepted back into the church. Jacob’s mother’s house, Michael Knauss’ s house and the Sun Inn in Bethlehem all were hospitals during the Revolution. Jacob, Jr. married Susanna Saeger in 1785, eventually having four daughters. In 1803, at the age 43, Jacob Jr. built this fine Federal Style house . At that time his girls were Barbara age 18, Anna Marie age 15, Anna Eleonora age 9 and Susanna age 6. He might have lived in his father’s log cabin while his house was being built. His wife Suzanna died in 1819, and he was remarried several years later to Elizabeth Arnold. Jacob, Jr. was known as a Revolutionary War soldier, a shoemaker and a builder. Jacob saw Emmaus grow from 92 residents in 1804 to approximately 130 at the time of his death in 1825. Because he went against the teaching of the Moravian faith, he was buried in God’s Acre, unrecorded and forgotten as a war hero. It wasn’t until later that the Liberty Bell Chapter of Daughters of the American Revolution found his name and the names of 11 men who serviced from Emmaus. They now are marked with the American flags. In 1803 Jacob Ehrenhardt, Jr., age 43, and Susanna Saeger Ehrenhardt finally decided to construct the house of their dreams - a house for them and their four daughters, Barbara, Anna Marie, Anna Eleonora and Susanna. The house was constructed on a knoll at the base of South Mountain, just outside the original Moravian village of Emmaus, Pennsylvania with a good view of the Moravian Church from the front door of the house. The house was oriented perfectly on the axes of true north, south, east and west with a small creek flowing by. Its German architectural elements included local field stone, a finely carved wooden doorway entrance, fireplaces, brick jack arches over the windows, and a well-crafted shutter system. The ancestors of the Ehrenhardt’s came to the new world from central Europe as a result of population growth, natural disasters, wars, inheritance practices, high taxes, debt and religious intolerance. Although of German heritage the Ehrenhardt’s were influenced by the English customs that had been well established in The New World. The plan of the 1803 House contains large interior spaces for special functions, spaces for work, sustenance, display and leisure. They chose to construct a house with distinguishing Federal-style architectural elements. The Germanic influenced structure displayed the influence of the Renaissance that had spread to England and The New World. - The construction may have been documented using refined drawings that matched a Moravian standard.